Down at the beach, the repaired bridle line proved to be spot-on in adjustment. Although bouncing left and right in the Gentle wind strength, the kite was pointing at about the same angle in both directions. Good! A sign that the Sled would settle down and fly straighter if the wind picked up. After taking some photos with the Sled on a very short line, I moved down the beach a bit. With a little more line out, more photos were taken. 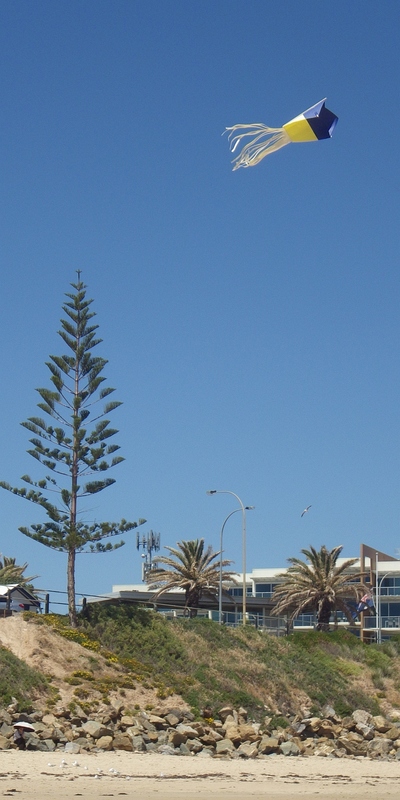 A quick check with the wind meter revealed that the breeze was averaging 16 kph with gusts to 19 kph. As in previous flights at this location, seagulls soon took an interest in the hovering 'bird' with flailing tails. 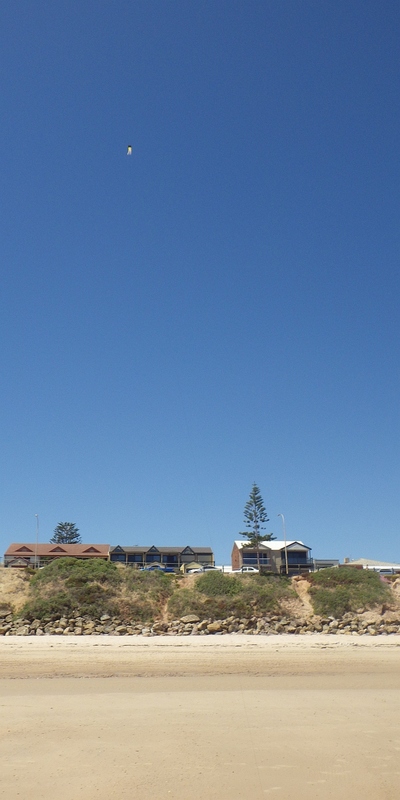 The gulls would pause in their ridge-soaring to approach the kite closely from downwind. Other gulls had near-misses with the almost invisible thread which stretched down to my bag on the sand! 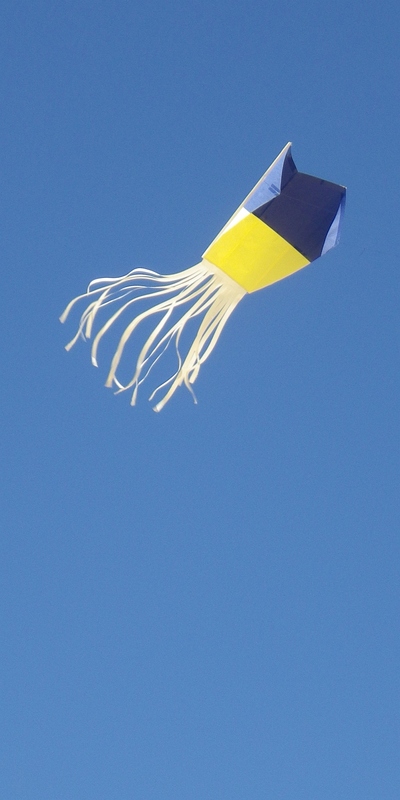 Out went the polyester thread, turn after turn, until the kite was just a tiny colorful shape against the blue sky. Tails fluttering away, some 200 feet above dry sand. After dipping to 13kph for some minutes, the breeze came back and seemed to be building slowly in strength. 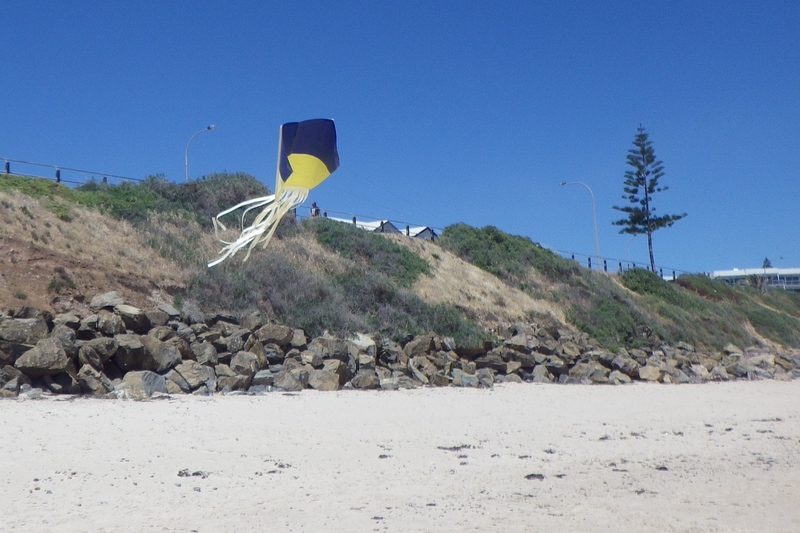 The Paper Sled kite was loving it, sitting fairly steady with just the occasional wobble to the left or right. With the polyester thread secured by the weight of my carry bag, timing of the flight commenced. The aim was to complete 3 hours of unassisted flying, for certification. Today, there were 45 minutes to go! 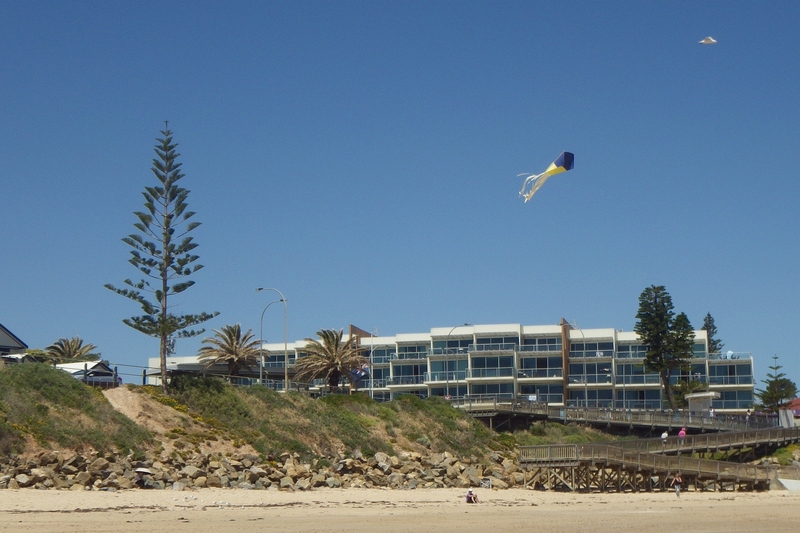 There were more people than usual on the beach since Winter temperatures had gone. In fact it was warmer than average for this time of year. After 50 mins of air time, I started to bring in the Paper Sled kite. With a good solid tension on the line, it was a delicate job. Quite different to hauling in 200 pound braided Dacron! 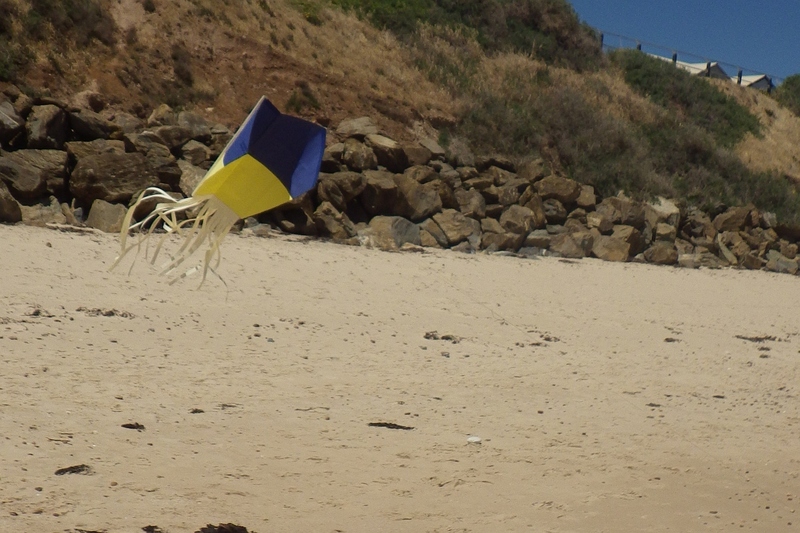 It was now a race against time as I kept lowering the kite, only to have the thread snap a short time later. The blue and yellow sheets of paper drifted to the sand. In a safe spot, thankfully. The breeze was now 24 kph with a gust to 28kph! 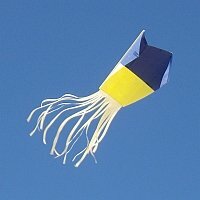 It did seem to suggest that, with stronger line, this little Sled kite would remain in the air well into the Fresh range of wind speeds. Not bad for a few pieces of A4 copier paper! Despite the small mishap right near the end, it was a fantastic flight in fantastic weather! 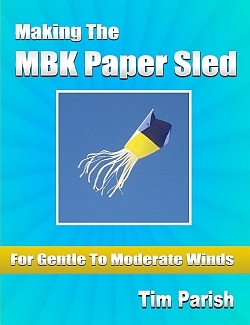 It might be some time before the Paper Sled kite flies again though... Because now it's full steam ahead to develop the MBK Paper Diamond.